1915 – Les Paul born. American jazz, country and blues guitarist, songwriter, luthier and inventor. He was one of the pioneers of the solid-body electric guitar, which made the sound of rock and roll possible, and is credited with many recording innovations. Although he was not the first to use the technique, his early experiments with overdubbing, delay effects such as tape delay, phasing effects and multitrack recording were among the first to attract widespread attention. He recorded with his wife Mary Ford in the 1950s, selling millions of records. 1934 – Jackie Wilson born. American singer and performer. Wilson was important in the transition of rhythm and blues into soul. He was considered a master showman, one of the most dynamic and influential singers and performers in R&B and rock history. 1997 – LaVern Baker died. American rhythm and blues singer, who had several hit records on the pop chart in the 1950s and early 1960s. In addition to singing, Baker also did some work with Ed Sullivan and Alan Freed on TV and in films, including Rock, Rock, Rock and Mr. Rock & Roll. In 1966 she recorded, as a duet with Jackie Wilson, the controversial song, “Think Twice”, which featured lyrics that were not considered appropriate for airplay at that time… or even today. She died from cardiovascular disease at the age of 67. Originally buried in an unmarked plot in Maple Grove Cemetery in Kew Gardens, New York, her grave received a headstone on May 4, 2008, after a fundraiser was held by local historians. 1789 – The Power of Sympathy or the Triumph of Nature Founded in Truth published by Isaiah Thomas in Boston. American sentimental novel written in epistolary form by William Hill Brown, and widely considered to be the first American novel. The novel mirrors a local New England scandal involving Brown’s neighbor Perez Morton’s incestuous seduction of Fanny Apthorp, Morton’s sister-in-law. Apthorp became pregnant and committed suicide, but Morton was not legally punished. The scandal was widely known, so most readers were able to quickly identify the “real” story behind the fiction: in every essential, Brown’s story is an indictment of Morton and an exoneration of Fanny Apthorp, with “Martin” and “Ophelia” representing Morton and Apthorp, respectively. 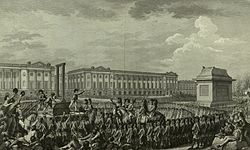 1793 – After being found guilty of treason by the French Convention, Louis XVI of France was executed by guillotine. Some accounts of Louis’s beheading indicate that the blade did not sever his neck entirely the first time. There are also accounts of a blood-curdling scream issuing from Louis after the blade fell but this is unlikely, since the blade severed Louis’s spine. It is agreed that while Louis’s blood dripped to the ground many members of the crowd ran forward to dip their handkerchiefs in it. 1938 – Wolfman Jack born. American disc jockey. In 1973, he appeared in director George Lucas‘ second feature film, American Graffiti, as himself. His broadcasts tie the film together, and Richard Dreyfuss’s character catches a glimpse of the mysterious Wolfman in a pivotal scene. In gratitude for Wolfman Jack’s participation, Lucas gave him a fraction of a “point” — the division of the profits from a film — and the extreme financial success of American Graffiti provided him with a regular income for life. 1942 – Edwin Starr born. American soul music singer, most famous for his Norman Whitfield produced Motown singles of the 1970s, most notably the number one hit “War”. 1984 – Jackie Wilson died. American singer and performer. Known as “Mr. Excitement“, Wilson was important in the transition of rhythm and blues into soul. He was considered a master showman, one of the most dynamic and influential singers and performers in R&B and rock history. During a 1975 benefit concert, he collapsed on-stage from a heart attack and subsequently fell into a coma that persisted for nearly nine years until his death in 1984, aged 49. 1997 – Colonel Tom Parker died. Entertainment impresario best known as the manager of Elvis Presley. Parker’s management of Presley defined the role of masterminding talent management, which involved every facet of his life and was seen as central to the astonishing success of Presley’s career. “The Colonel” displayed a ruthless devotion to his client’s interests and took more than the traditional 10 percent of his earnings (reaching up to 50 percent by the end of Presley’s life). For many years Parker falsely claimed to have been U.S.-born, but it eventually emerged that he was born in Breda, Netherlands, real name Andreas Cornelis van Kuijk.